Library cardholders may manage their loans and requests online. All material may be renewed except for materials with reserves and materials on which you owe fines. Please Note: Inter Library loans must be renewed through the Inter Library Loans Service portal and not through My Library Card. 1. Log in to your My Library Card Account. 2. 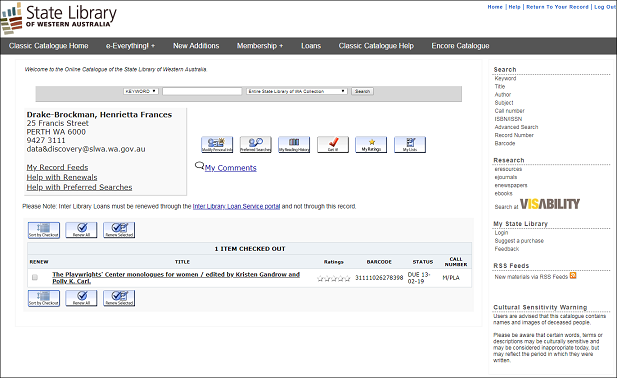 If not the default view, click the "Items currently checked out" link to view the items you have checked out. 3. Select the items you want to renew by checking the boxes in the RENEW column and then click the Renew Selected button. If you want to renew everything, click the Renew ALL button. 4. If any items cannot be renewed, a message will appear on the screen. If you are successful, a new due date will appear in the "STATUS" column. Always check the STATUS column for information on the success or failure of your renewal.